💡 Tip Series: The newrow_ blog Tip Series discusses popular elearning trends and how the newrow_ online teaching platform can best be utilized to get you and your organization on-board. In this post, we’re going to talk about blended learning and how utilizing newrow_ smart can not only replicate the physical classroom online, but with a little-bit of production know-how can maybe even improve upon it. So, what’s blended learning? Blended learning education programs combine online tools and media with the traditional physical classroom or training workshop. According to Curtis J. Bonk and Charles R. Graham, who literally wrote the (hand)book on blended learning, “Blended learning systems combine face-to-face instruction with computer mediated instruction.” The idea is not to replace the traditional classroom with on-demand online courses, but enhance face-to-face instruction with online tools & media and on the flip-side enhance online learning with face-to-face instruction (Related article here). Necessary convenience —Working adults are increasingly going back to school for continued professional education or signing up for classes that align with their hobbies. These courses typically take place after work. Driving to a “brick-and-mortar” isn’t always doable. Limited space — Offering classes online, means turning less potential students away when space is limited. Blending the physical class with an online tool means no one is left out. More reach — Offering online classes means more potential students beyond driving distance. Brand awareness — The courses being taught are valuable content. Publishing them live to social networks or recording them and sharing them on-demand builds excitement and awareness for your brand. When offering a live online class through Newrow, instructors can include remote students in vibrant in-class discussions. 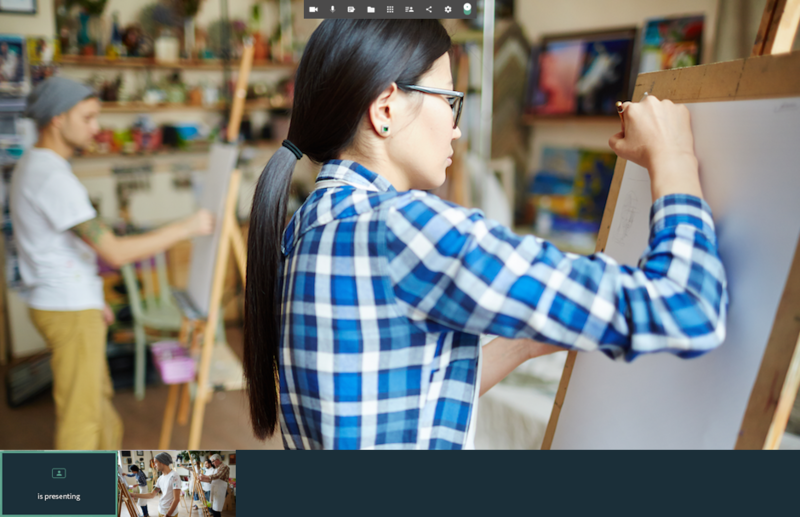 If the class has rich visual elements, such as an art class that has both face-to-face instruction as well as technique, then adding camera coverage is an effective way to improve upon the physical class online. Camera coverage is actually a filmmaking term where multiple camera placements are used to capture various angles of the same scene. In post-production editors can then use the various angles to heighten the impact of the scene by cutting to different shots. In our live classroom setting, we can have a few different shots of the classroom without adding a bunch of equipment. Let’s take the example of an art class. Our instructor is an artist that owns an art studio. As an added source of revenue, the artist offers in-studio classes a couple of times a week. The artist has been doing this for some time and has garnered quite the reputation so that the weekly classes are always full and some students are always left out. Buying a new studio is not on the table and offering more classes a week is just not possible. The artist then decides that to keep up with demand she will offer her classes both in-studio and online. For her wide shot, our artist wants the online students to feel as if they are part of the physical class so she sets up her webcam to see the whole studio. This is a great way for online students to see the other students and get the feeling that they are a part of the class. However, during the class the artist brings the students over to her easel to show them a specific technique. The wide shot isn’t great here for our online students so our instructor has also placed her Android phone (connected with camera to her newrow_ smart room) much closer to see only her canvas and her brush. She switches the presenter view from the wide shot to the medium shot so that her online students can follow-along. 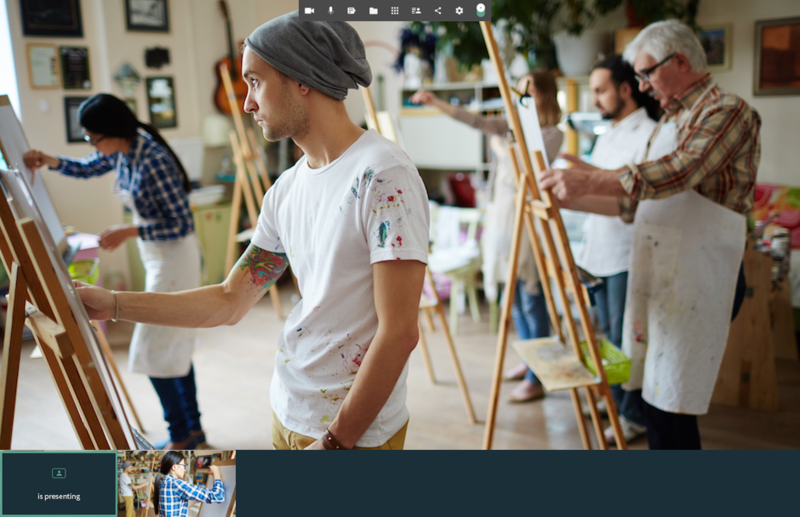 The live mixing of showing the wide-shot of the class, the close-up of the paint brush and even mixing in some online participants creates a dynamic, engaging and impactful learning experience for online participants. It’s easy to do. Just enter your newrow_ smart room by going to the direct URL with a couple of devices and you can mix up which ever camera is on the presenter view by clicking the presenter icon on the specific feed. newrow_ is a browser-based, interactive video collaboration platform built for teaching online.